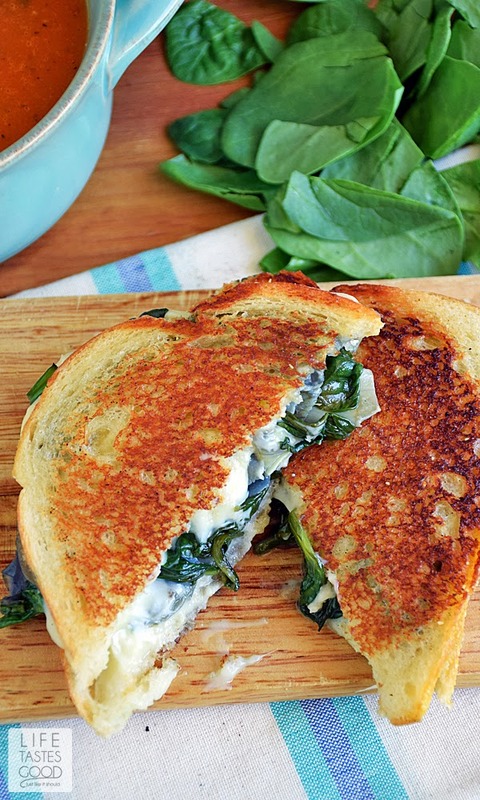 Spinach Artichoke Grilled Cheese is the classic dip in sandwich form and totally tasty! 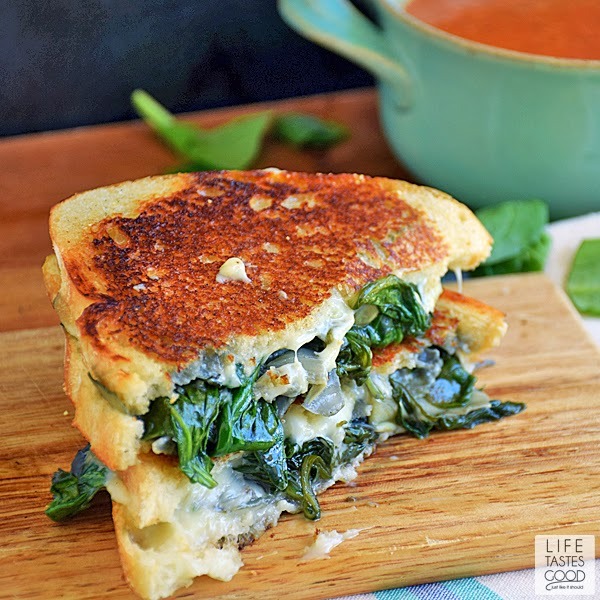 This Grilled Cheese sandwich is loaded with fresh spinach, artichokes, and lots of ooey gooey, melty cheese! 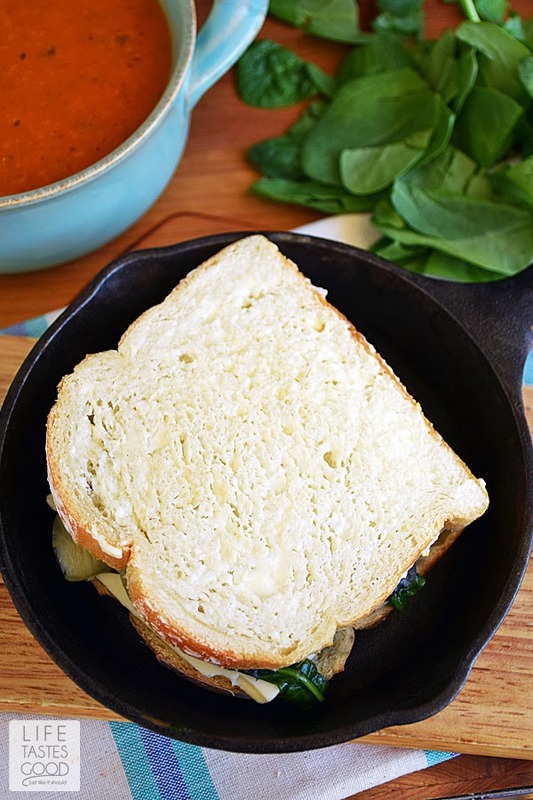 It's a classic flavor combo, and I'm excited to share it with you in this tasty sandwich recipe! 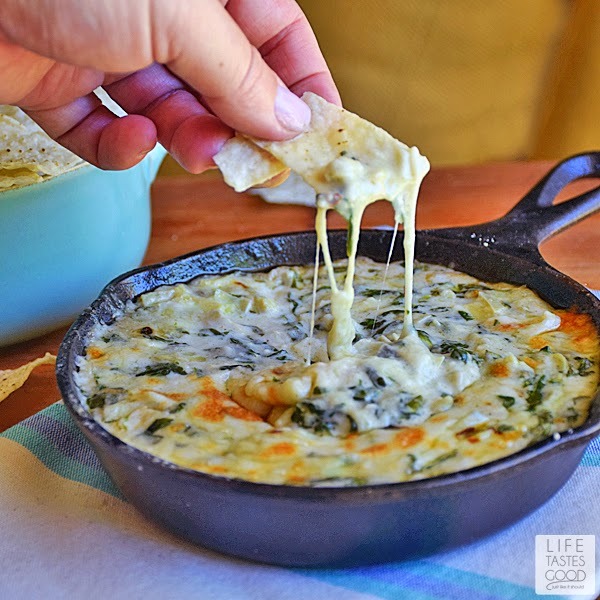 Gallo Family Vineyards and our #SundaySupper family have joined forces to honor this cheesy month in a most delicious way. 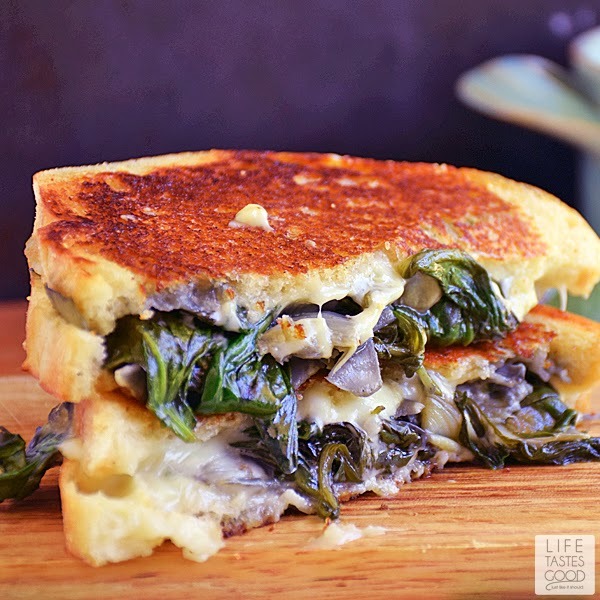 Be sure to scroll down for a list of all the #SundaySupper Grilled Cheese recipes and wine pairings! I know you'll want to try each and every one of these tasty pairings! I sure do!! I have to admit, I am a bit of a grilled cheese snob. I am very fussy about how my sandwich is prepared. Some claim that toasting both sides of each slice of bread is the key to a good grilled cheese, but that's not my thing. I like the classic preparation of toasting just one side of each slice. Others swear by using mayonnaise instead of butter to toast the bread. That's not my thing either. I guess I'm a traditional kinda girl, because I'm sticking with butter when it comes to making grilled cheese! Some folks melt their butter in the skillet and then add the bread! This is not acceptable to me! A light coating of butter, not missing a spot, all over the bread is the only way to go when it comes to making a perfect grilled cheese sandwich (in my opinion, anyway). Have everything you need ready to go. I start with room temperature ingredients. This is very important. Butter at room temperature is easy to spread which makes it possible to apply a very thin layer on every inch of the outside of the bread. The cheese will melt more evenly and you don't have to worry about burning the bread just to melt the cheese. What good is a grilled cheese sandwich if the cheese isn't melted?! I start off by sauteing the artichokes in a little bit of butter to brown them slightly. then I add the garlic and spinach and heat until the spinach wilts. I set that aside until I'm ready to fill my sandwich. Next, spread a very thin layer of butter on one side of each piece of bread while heating a skillet over mid-high heat. I prefer to use a cast iron skillet for maximum crispiness, but a stainless steel skillet will work nicely too. Avoid using a non-stick pan. The bread simply won't crisp up as nicely in a non-stick pan. Lay one piece of bread, butter side down, into the hot pan. You should hear it sizzle as soon as it hits the pan. If you don't, the pan is not hot enough and you'll have a greasy sandwich, so turn up the heat if needed. Working with room temp ingredients allows us to use a higher heat to avoid making a greasy sandwich. While the bread is toasting, add a slice of cheese on top of it and top that with the spinach artichoke mixture, then add another slice of cheese and top with the other slice of bread - butter side up this time :) Carefully check the underside of the sandwich by lifting up one of the corners to check for a beautiful all-over crispy golden outside. It should only take about a minute, so once you are done topping the bread it should be close to turn over. When ready, carefully flip the sandwich over and toast the other side. Again, it should only take about a minute. When both sides of the bread have an all-over beautiful golden brown crust on the outside and the cheese is nicely melted, remove from the heat, slice on the diagonal, and enjoy! Be sure to pair this with a delicious wine for a truly magical experience! I recommend Gallo Family Vineyards Pinot Noir. It is a versatile wine that pairs with just about everything. With a subtle earthy flavor and a smooth, light finish, you can't go wrong! If you prefer a white wine, I recommend the Moscato. It pairs beautifully with Gruyere cheese and the sweetness complements the savory goodness of this sandwich nicely. 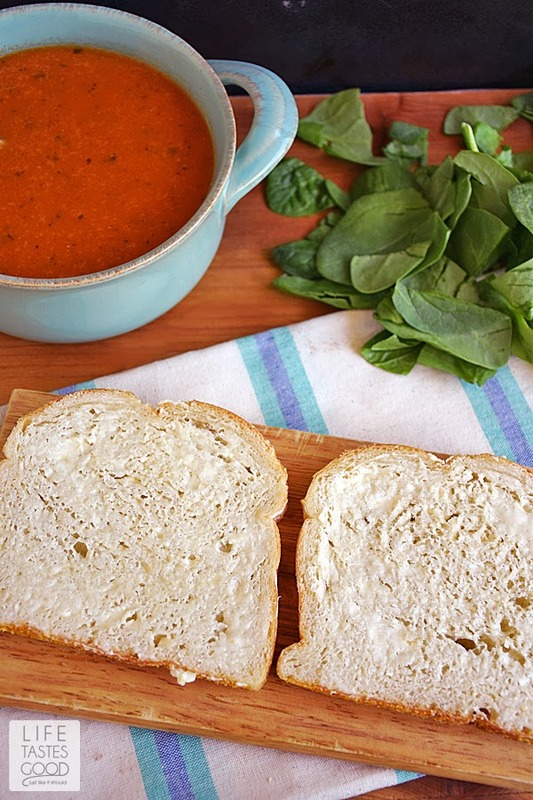 This sandwich tastes so good with my favorite Tomato Basil Soup, so be sure to make up a batch for dipping! Enjoy! In a skillet over mid-high heat, melt 1 tablespoon of butter. Saute the artichokes to brown them slightly. 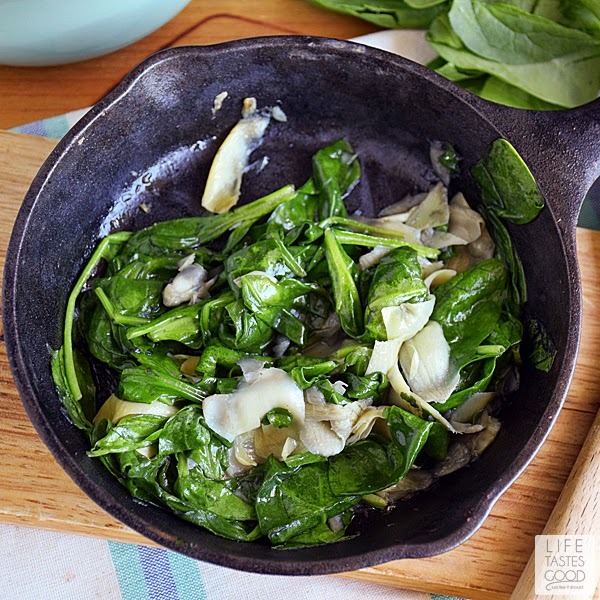 then add 1 teaspoon of garlic and 1.5 cups fresh baby spinach. Heat until the spinach wilts. I set that aside and keep warm until I'm ready to fill my sandwich. 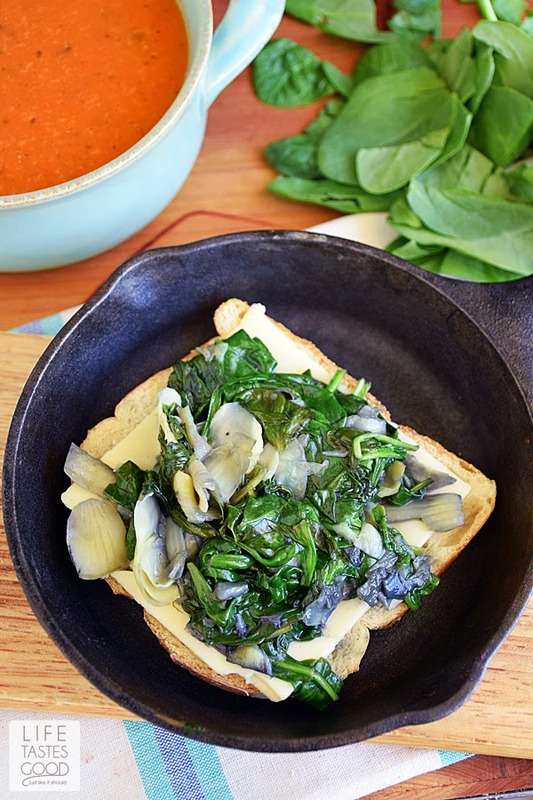 While the bread is toasting, add a slice of cheese on top of it and top that with the spinach artichoke mixture, then add another slice of cheese and top with the other slice of bread - butter side up this time. Carefully check the underside of the sandwich by lifting up one of the corners to check for a beautiful all-over crispy golden outside. It should only take about a minute, so once you are done topping the bread it should be close to turn over. When ready, carefully flip the sandwich over and toast the other side. Again, it should only take about a minute. 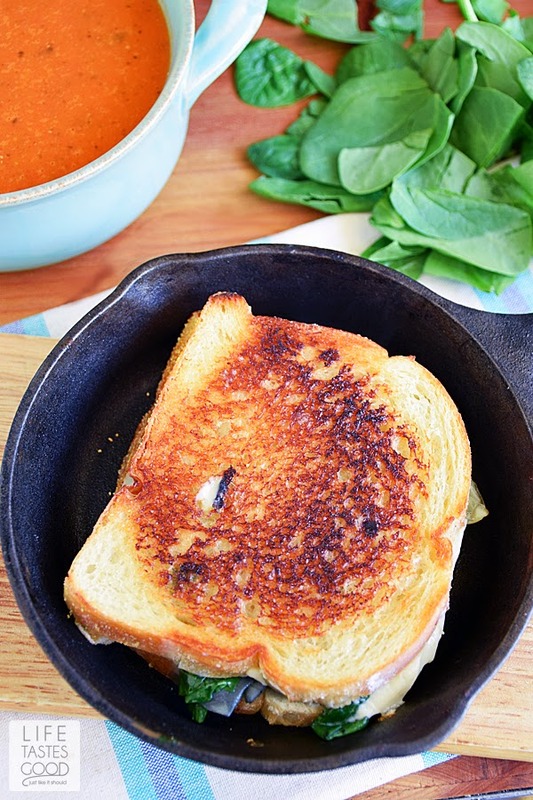 You have so many of my favorite ingredients in this grilled cheese! Thanks for sharing with #SundaySupper. 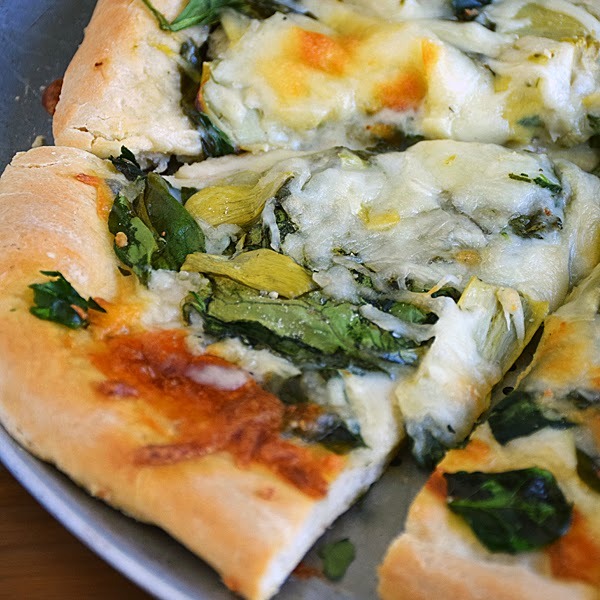 I have a friend who loves spinach and artichoke as much as I do. I'm thinking of inviting her over and making this for her and enjoying with a lovely glass of wine. I use the traditional method, too. But I've never added spinach AND artichokes!!! LOVE this! Yummy! What a great combination of flavors. I love the artichoke! So creative! Ohhhh yes!! I could gobble up a few of these awesome sandwiches!! That makes 2 of us, Bobbi :) Thanks for stopping by! It just doesn't get any better than this! Wow!! 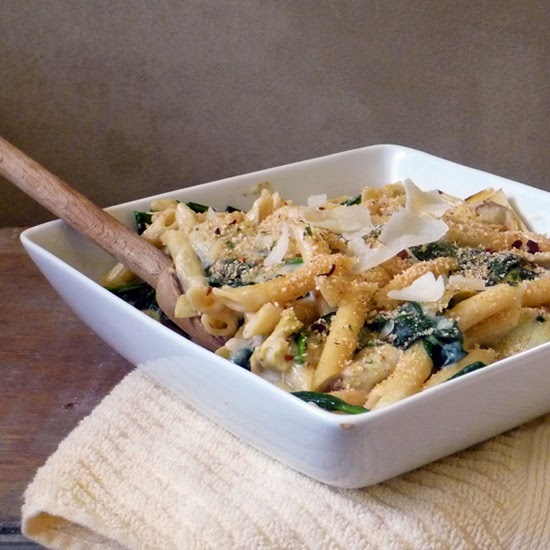 This looks like the perfect spring dinner for me! 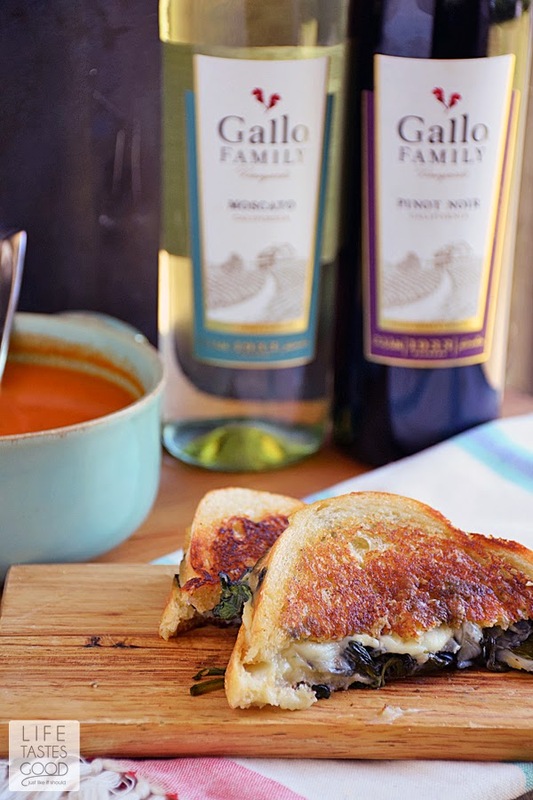 Love the flavors in this sandwich and paired with the wine and tomato soup....that'a whole lot of YUM! I used to work at a grilled cheese shop and this was one of the sandwiches we made. So delicious! It is my favorite way to have a grilled cheese. I like the traditional way of grilling a sandwich too! I never heard to grilling both sides - that won't happen, ever! haha! 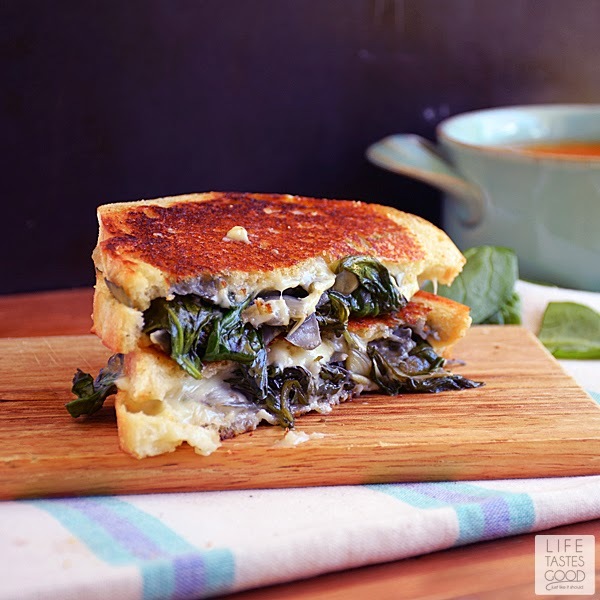 Love all your ingredients in this sammie, especially the artichokes! haha we are nothing if not set in our grilled cheese way haha Thanks, Sandra! Oh yum- there is literally nothing I don't love about this sandwich! I love that this is my all time favorite dip but on a sammy! Delicious! I couldn't agree more, Serena! Thanks! I make my grilled cheese with a light coating of butter too! This one looks totally fabulous! That's the only way to go!! 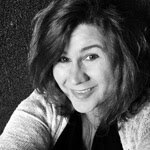 Thanks, Sheena! This looks to die for! I love pizza with these toppings, so I know this would be awesome. Great idea Marion!